Quartzite is a wonderful material for architectural designing, and interior as well as exterior decoration. And, there are a couple of factors that make it just apt for all such applications. It boasts the looks of a marble, but possess the strength of granite; even stronger than granite! Incidentally, there is a lot of confusion in the market regarding this amazing natural stone. Many suppliers take the advantage of this confusion and sell it with the tag of marble. So, it is always a good choice to go for a genuine and reputed supplier of quartzite. There are different types of quartzite countertops and choice is always yours. Over the years, India has managed to establish its name in the global natural stone market for the quality of stones quarried right here and better reputation of natural stone manufacturers and suppliers from India across the globe. Therefore, if you are looking for quartzite for your construction and renovation needs, you can contact a globally renowned quartzite exporter from India, such as Regatta Universal Exports. With more than 17 years of experience in manufacturing and supply of natural stone products in every corner of world, Regatta has been exporting high-quality quartzite products in almost every country. Dedicated customer service, stringent quality checks, on-time deliveries, reasonable prices and state-of-the-art safety measures during transportation are some of factors come with Regatta Universal Exports for an unbeatable customer experience. Despite many confusions regarding quartzite, it has gained immense popularity worldwide for its distinguishing features. It is used for a bevy of construction applications, both inside and outside homes. Roofing, wall cladding and paving are some of quartzite’s outdoor applications, while steps, risers, flooring, countertops and interior cladding are its popular indoor applications. Durable than Granite: It is similar to granite in many ways, but when it comes to strength, it simply outshines granite with a rating 7 on Mohs hardness scale. In fact, it is stronger than any other natural stone used for countertop. Thus, can be used for installation at highly functional areas inside home like kitchens. Has the looks of Marble but doesn’t Etch Like the Same: It is really very tough to differentiate between marble and quartzite because of nearly similar looks and surface design patterns. You may find many sellers displaying something that they call “soft quartzite.” Well, the reality is there exists nothing like “soft” quartzite, and these so called “soft quartzite” tends to appear and wear just like marble because they are actually just another marble. Quartzite is never soft, and never etches or chips easily like marble. So, quartzite makes for a great choice when you want the looks of a marble, but still worried about its softness and porosity. 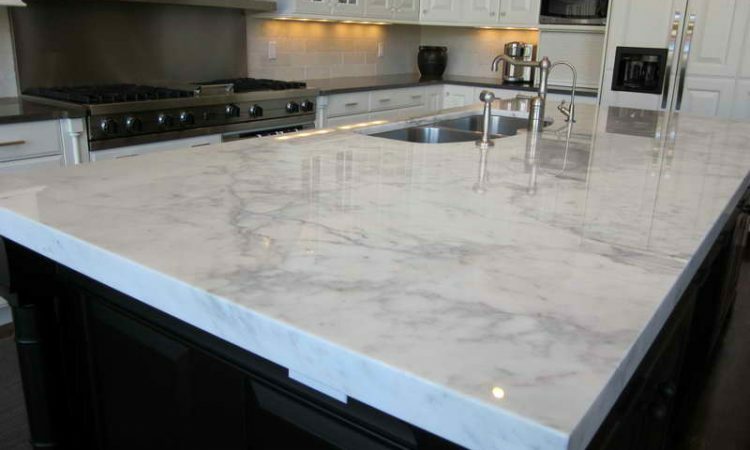 Affordable: Owing to its wonderful properties, it may seem to be an expensive countertop option. While quartzite can be costlier than wooden or laminate countertops, it is still cheaper than many varieties of marble. Nevertheless, the price depends on the “rarity” and demand of any natural stone; be it granite, marble or quartzite. The thickness of the countertop slab also decides the price of the quartzite countertop; more the thickness, higher would the price. Lesser Maintenance: It requires less maintenance effort and so is the cost of maintenance. It’s has a decent resistance towards scratches and is fairly non-porous when compared with other natural stone options for countertops. Many a times, it won’t even require sealing as well, but that depends on the quality of the quartzite and the place of its installation. Its resistance to heat and stains further make it a perfect countertop material for kitchen applications. Sounds like Quartz, but Quite Different: The most prominent difference is that quartzite is a natural material, while quartz is a man-made material comprising quartz particles bound with Quartz is relatively less expensive, less prone to stains, non-porous and available in umpteen shades, but when it comes to toughness and durability, quartzite always stands above quartz. Moreover, the natural grace quartzite offers to an interior space is simply can’t be compensated with any artificial material. So, the next time when you plan for home improvement or kitchen renovation, do consider this beautiful yet affordable stone that can give the advantages of both marble and granite. This would not only impart an enticing look to your interior spaces, but also assure you of hassle-free maintenance and long life of your quartzite countertops.